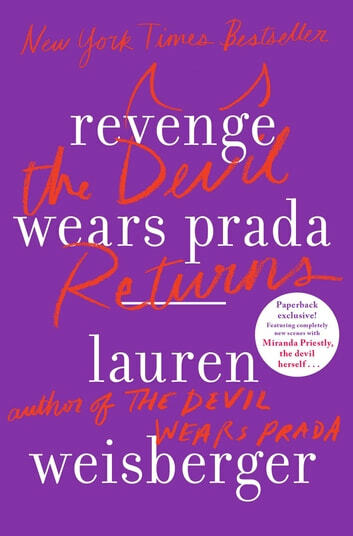 I love the original Devil Wears Prada book. It was engaging, frustrating, funny and heartwarming and I've read it a few times. I had cautious hopes for this one and wasn't terribly disappointed but it still was not as good as the first. By the end of the book, I was fed up with Andy and her childish and stubborn ways of dealing with her problems and other people. Granted, she wasn't being met in the middle with either her best friend or husband, but still. I enjoyed Emily even though she was vapid and self- obsessed, but that was part of her charm. As always, I love to hate Miranda, though the surprise that she was very supportive and engaging with Andy about her pregnancy and child seemed like a bit of a departure from what I knew her to be. Overall, an enjoyable, mindless read but definitely not as good as the first. If there is another I hope for more maturity on Andy's part and maybe something a little different. Well, that was a loss of time. First off, I want to mention that I liked Devil Wears Prada. I thought it was fun...although I liked the movie better. Revenge Wears Prada is false representation. You see Miranda a mere 3 times, not even 3 full chapters. And she doesn't really take her revenge...it ISN'T revenge. It has nothing to do with it. NOTHING. I also want to mention that this book is a 381 page of nothing. Nothing happens. It's boring. Boring boring boring. The characters in the book don't even hold their previous anything. It's like they are teenagers instead of aging 10 years. This "book" was obviously written to ride the wave of Devil again, because the "author" obviously cannot write a decent book. She needed more money from her sole "decent" book. Do not buy this book, do not borrow this book, do not waste your time with this book. It's not even movie material as NOTHING happens. I think the "author" just has a fantasies of a prestigious lifestyle she will never ever be able to get her hands on. Have I mentioned that nothing happens for 380 pages and that it's a total waste of time? Oh and I predicted the ending the second I opened the book...LOL. Seriously, this isn't worth you time. It sure as hell wasn't worth mine. Oh and Miranda isn't even really her Miranda self. Did I convince you this book isn't worth it yet? DO NOT READ THIS BOOK! There is nothing more to say. DO NOT READ THIS BOOK. Being the sequel of such a good first novel I would have expected so much more. I found it difficult to read, the story doesn't take off and nothing jumps off the pages. Quite disappointed in reading the whole thing to discover that it wasn't as exciting as I'd expected. A nice light read. Likely won't win any literary awards, but had a good flowing storyline for the most part.